In the first 6 months of 2017, Perodua sold 99,700 vehicles, an increase of 2.4% compared to the same period last year of 97,400 units. The most significant increase came from the Perodua Axia. “Based on our internal estimation, the total industry volume (TIV) from January to June this year would reach 284,200 vehicles, which means that Perodua’s market share will be around 35.1% so far this year,” Perodua’s President and Chief Executive Officer Datuk (Dr) Aminar Rashid Salleh said. 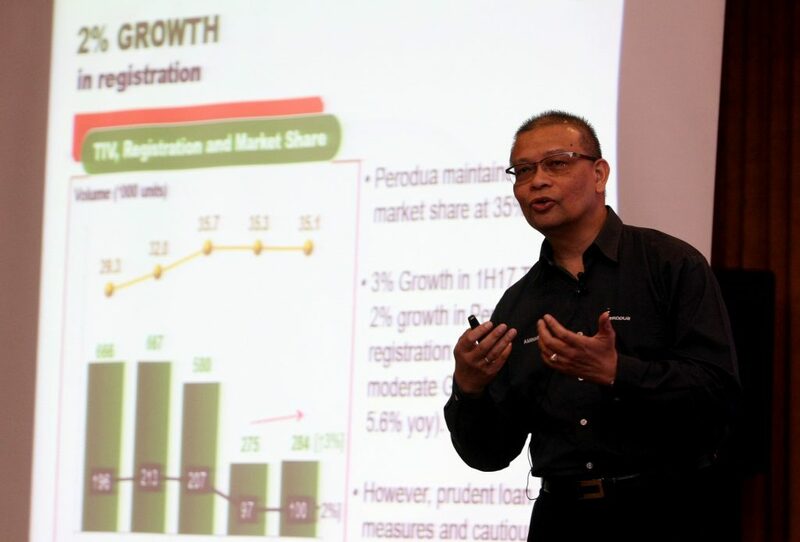 He said that during the first 6 months of the year, all Perodua models were number one in their respective segments with the Axia selling 32,600 units, followed by the Bezza at 28,300 units, Myvi 24,000 units and Alza with 14,700 units. “Also based on our internal observation, the total industry volume has improved by 2.3% to 284,200 for the first half of 2017 compared to 275,500 vehicles in the same period of 2016,” he said. Aminar said that the increase in sales for the first half of the year was due to aggressive sales campaigns initiated by almost all automotive players as well as new models introduced in the market during the time period. In addition most auto players were also clearing the carry over 2016 stocks with attractive discounts and over trade. “Despite the improvement in sales, we foresee that the tighter lending guideline is still by far our greatest challenge to overcome as most of our customers are first time buyers,” he said. This year, Perodua will focus on its current model line-up by offering attractive promotions for the consumers. “This include our on-going Raya Celebrations ‘Salam Syawal’, which offers amazing offers on selected models as well as Perodua’s celebration of the Myvi’s 12th anniversary,” Aminar said. He said that the Perodua is also initiating a special campaign for the Myvi which see cash give-backs of up to RM7,500 in celebration of the model’s popularity with Malaysian drivers. “We welcome everyone to visit the most convenient Perodua Sales showroom to see the amazing deals await you. Also, we invite the public to take part in our Myvi 12-year anniversary which offers a cash prize of up to RM12,000,” Perodua Sales Sdn Bhd, Managing Director, Dato’ Dr. Zahari Husin said. “Please visit our sales and service outlets as well as our official social media channels to find out more,” Zahari added. On after sales, Perodua saw 1.02 million vehicles coming into its service centre for the first 6 months of 2017, an increase of 1.2% from 1.01 million intakes for the same period of 2016. Meanwhile on exports, Perodua shipped 1,854 vehicles to 6 countries for the first 6 months of 2017. “The recent introduction of the Bezza in Mauritius and Sri Lanka has been well received with the model selling 8 units and 79 units respectively,” Aminar said. On production, Perodua produced 96,600 vehicles for the first half of the year and expect to produce 197,000 by year end.